If you don’t already know, I L-O-V-E images. From free stock images to using sites like Pixabay, if they’re free to use on blogs and for my clients, I’ll spend the time finding the perfect one. True – I might spend too much time designing my blog images, but it’s a nice break from freelance writing. But, something I never thought of in a million years, was that my blog images generated work and sales for me as a freelance writer. And what’s neat is that I’m not advertising that I do blog images as a service. So, how do my blog images make me more money? 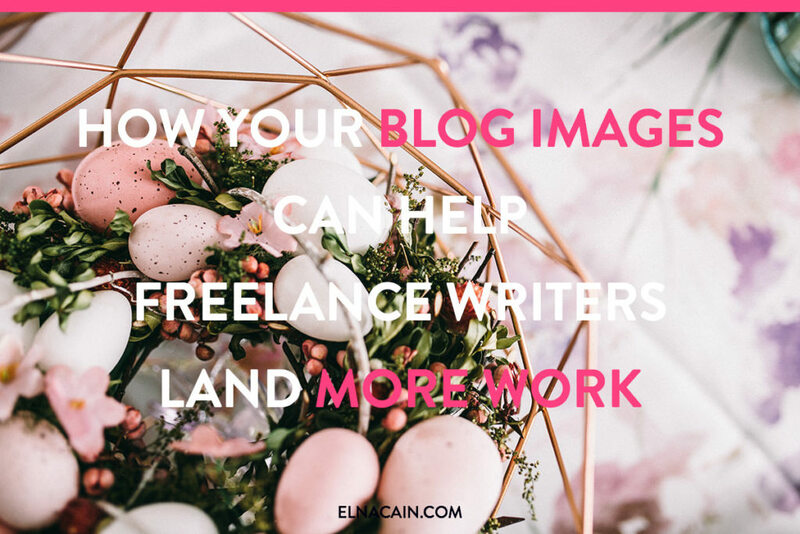 Before we get into that, want to know how to make a slammin’ blog image for your blog or clients? I personally use Photoshop, but if you’re bootstrapping your biz, Canva or Picmonkey has got you covered. Here are some key things to help your image reach more people. Canva and Picmonkey both offer the option of using a text box. This is a box that can be transparent and it’s placed behind your text. This makes your text pop out and clearer to read. This is how my feature image would look without a text box. I tried to make it more legible by making the font white instead of black, but as you can see, it’s still very hard to read. Some images don’t need a text box. Those images typically have very little distractions, but generally if you want your image to stand out, try using a text box. A pro tip is to make your box a bit transparent. I know Canva has this option, but not sure if Picmonkey does? Don’t you love fonts? I do. I can spend all day trying out new fonts and scripts. But, if you’re doing an image, the best practice is to choose one font and one script font. A script font is a fancy font that’s like a handwriting or brush font. 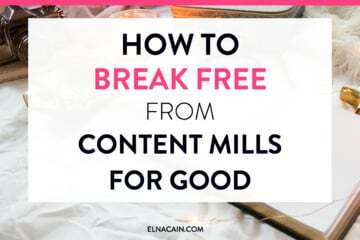 These fonts are typically a little harder to read, so to make your image readable, choose only one or two words to emphasize – unless you have a short title or unless the font is easy enough to read ( you can then use a script font for your entire headline). A rule of thumb: capitalize your main font (sans serif font) and don’t for your script font. If you want more traffic to your website, then start branding your images. For the longest time I wasn’t really branding my images on this blog. I would pick any picture, choose any font combination and there ya go! No rhyme or reason. But, once I started my new blog, Twins Mommy and branding those images, I noticed something. More people were following me on Pinterest and I was getting more traffic. So, I made the switch and started branding my images on this blog and have noticed a similar change. When choosing a brand style, you want to focus on colors, fonts and images. Use your brand color, find a pair of fonts that you like and chose similar styled images. Play around with your branding style. You can look on Pinterest for inspiration. Always promote your website on your images. I always put my website name at the bottom of my images. This makes it easy for people to identify my images with, which helps bring traffic to my site. 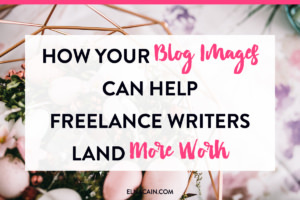 Okay, so how does your blog images help you land more work? I’ve said it before and I’ll say it again, social media can be a goldmine for finding freelance work. A lot of my work came from Twitter, LinkedIn and Pinterest (recently). By being able to share your blog post and images your audience sees it and can re-share it. This has probably been the number one way I’ve landed graphic work. Someone sees my posting, goes to my blog and contacts me for work. BOOM! Look, I know I’ve mentioned to niche down and only write about one topic but, that doesn’t mean you can’t ever take on a project outside your niche. When clients or prospects go to my blog, they see an engaged blog. They see great images, social shares and comments. They also see how you manage your blog. Are there a ton of ads on it? Is your side bar bloated? Having a professional looking blog can often help you land some design or graphic work. What’s great is once you build up your skill set in different areas, you can bundle your services and upsell your prospect. When I tell them this, I give them an adjusted quote and most clients take this because I show them the value I provide. Not only do I just write a blog post, but it’s optimized, shared, and handled all by me. 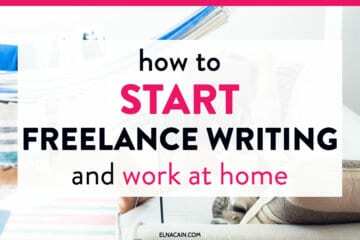 So, if you can find a way to offer a bundled package for your prospects, you’ll be able to earn more money as a freelance writer. Do you think a client would rather hire a writer that only knows how to write a blog post or someone that knows how to use IFTTT or Trello or has a lead magnet to grow their email list? I don’t know about you, but I feel content clients want writers that know the online world. 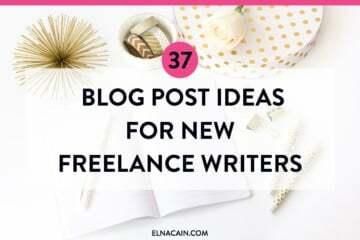 They want writers that have a presence on social media and are familiar with how to start a blog, grow an audience and various online tools and apps. When prospects see my blog, they know that I know what I’m doing. This helps me land more gigs at a higher rate since they know they’re getting more than just a writer. For me, they’re getting a digital marketer too. I’m all about blogging. I mean I’m a blogger and a freelance writer. I have several blogs. 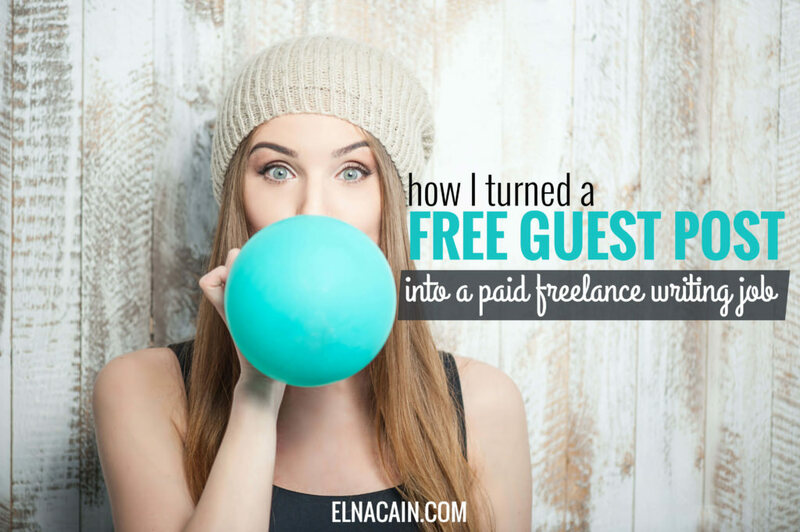 I know your blog can help you land freelance work. In particular your images can help spread your brand and get in front of potential clients. Many of my graphic design clients are other freelancers or solopreneurs. I guess they liked what they saw when they visited my blog! 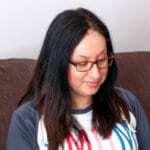 Over to you – is your blog helping you land freelance writing work? I’m just starting putting images in my blog now (I’ve got quite the backlog) and these tips are perfect for getting started. My biggest problem was working out how I would keep the images looking consistent – and that’s to use the same font and text over it. All of your blog images even without the text look the same. How do you get that look? The best way is to use a free photo platform that has a similar brand and style! Great tips. Your graphics really stand out on Pinterest. I was curious about the text boxes. Thanks for the tip. Canva is wonderful for creating blog images thanks to your tutorial on the course. You’re welcome. Glad you found out how to use Canva for your graphics. Just brilliant tip! Can’t wait to try them all today. My searching has ended now after getting your tips and idea. Thanks and keep sharing like this in future too. Thanks so much! Glad this helped! Great stuff Elna! This is me just checking out if my Gravatar is working – not the techy type so let’s see what happens. Also, I’m enjoying your Writeto1K course! Cheers. Robert. I liked your story about branding your images. As you know, blogging isn’t just about writing, it’s also about getting others to read your writing. Standing out in the blogosphere takes effort—but it’s a key skill employers will be looking for. So focus on getting your personal blog out there, and you know how to do it. I was wondering how you design your blog images. Could one use Adobe Illustrator instead of Photoshop for blog image design? I ask because I am considering buying the Creative Cloud Membership where you can get one program for $19.99 a month and would like to use Illustrator ( it is more fun to use). I’m sure you could use Adobe Illustrator for your images (I think Cole of Pines Up North does), but for me, I like using Photoshop. You can also use Canva too! Thank you so much for your insight. I am an up and coming writer who is trying to wade into deeper waters (of time management, consistency, and focus). I have been writing a column for three years for a newspaper, but have not parlayed that consistency into an online presence. I am going to look into a portfolio site until I master the art and science of social media to develop a following. This is so helpful to me. That’s great! So happy to hear you are getting out there and taking action. It’s me again. I am testing my Gravatar out (as per your suggestion). However, to my great disappointment, I can see that my Gravatar image is not to bothered with appearances today. Could you please advise? Your Gravatar is associated to the email you synced it with. So when you leave a comment make sure to use that email that you used for your Gravatar! I’m currently taking your online course- what a warren of wisdom! Each link I click offers twelve million and two tips, and the beat just goes on and on. Thanks for such informative, functional, and inspired content. For the budding novice (me) it’s lifeblood. That’s great. Although I use PS for my graphics, I have dabbled with using Canva and like how easy it is and your images look totally professional! Thank you for these great tips. Just started using Pinterest more for my business and taking the time to brand my images before adding them to my blog. Still working on fine tuning a few things. Loved your Pinterest webinar by the way! That’s great you’re on my Twins Mommy list! Thanks. I’m working to creating a lead magnet and making that my start! 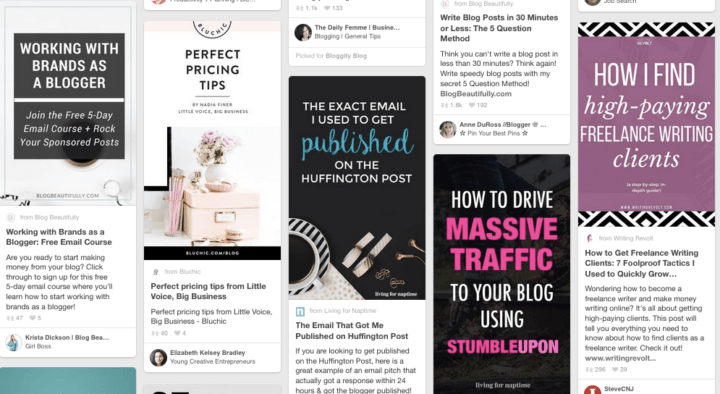 ha… anyways, I hope you get loads of traffic from Pinterest! I know right? I didn’t either until way later when I started blogging. It’s a learning curve for sure! Glad this helped. Great writeup Elna and excellent tips. I would love to share them with my google group it that is okay with you. Go ahead and share away! And thanks for your comment. That’s great to know! Thanks so much. I love hearing from readers and how they are learning some great tips from my blog 🙂 I know I’m not just writing for myself or a few people! Thank you for sharing this excellent post. Incredible how visual we humans are, and impressed by the right picture presented the right way! And there are so many quality options for free stock photos, from Unsplash to Negative Space, to stocksnap.io. Good reminder to optimize these! Great resources you mentioned. My favorite is actually Kaboompics but when I was writing this post, their site was down so I didn’t link to it! Thank you for sharing this. I have been looking for tips on creating bold images. This sums it up. Looking at Pinterest for ideas definitely helps.